City of Djinns by William Dalrymple is a travelogue novel I read several years ago about the authors love affair with the city of Delhi. The colourful stories of his time and experiences learning about the history of this intriguing city made for a compelling reason to try and follow in his footsteps. Classical poets and music romanticize monsoon. The intense heat, languid afternoons, walks in the gardens and the smell of freshly washed flowers…romance blossoms and is rekindled in the warm rains. A welcome relief from the intense heat at this time of year, it is a time to come out and appreciate nature, the trees have a new sheen to them after being washed, watching children play in the rain..remember when you were a kid? splashing in puddles, standing under drain pipes, dancing in the rain… even on cold days when it rains the noise on my tin roof is comforting and soothing. Six years ago my first visit to India was in the intense heat of summer, what was I thinking? Not realising that pools are generally not common place in hotels here, it was so hot I longed to stay somewhere with a pool. The trip to Rishikesh was long and hot and the relief of a swim was so longed for. Upon arrival, the pool looked so inviting, but as it was getting dark, it could wait until tomorrow. The morning came and to my horror, the pool was being emptied! ” Monsoon is coming madam” of course it would have overflowed…. aghhhh… Monsoon came the promised day and it poured. After initially thinking this was grim I began to enjoy the rain and the joy it brought. I met an extraordinary woman during monsoon, we have remained friends ever since. Maybe we met because of monsoon. The best part of this monsoon was that I met an extraordinary woman, we talked and talked, and did yoga together for a few days then she flew back to her side of the globe and later I went to mine. We have remained friends ever since. Maybe we met because of monsoon. Monsoon brings people together, in a sort of “we are all in this together ” frame of mind as witnessed today in Old Delhi. We were aware that monsoon was in full swing, and living in a sub tropical climate we are used to heavy rain. What was an experience it was being in Delhi, a city of 24 million people and an infrastructure that is overloaded. 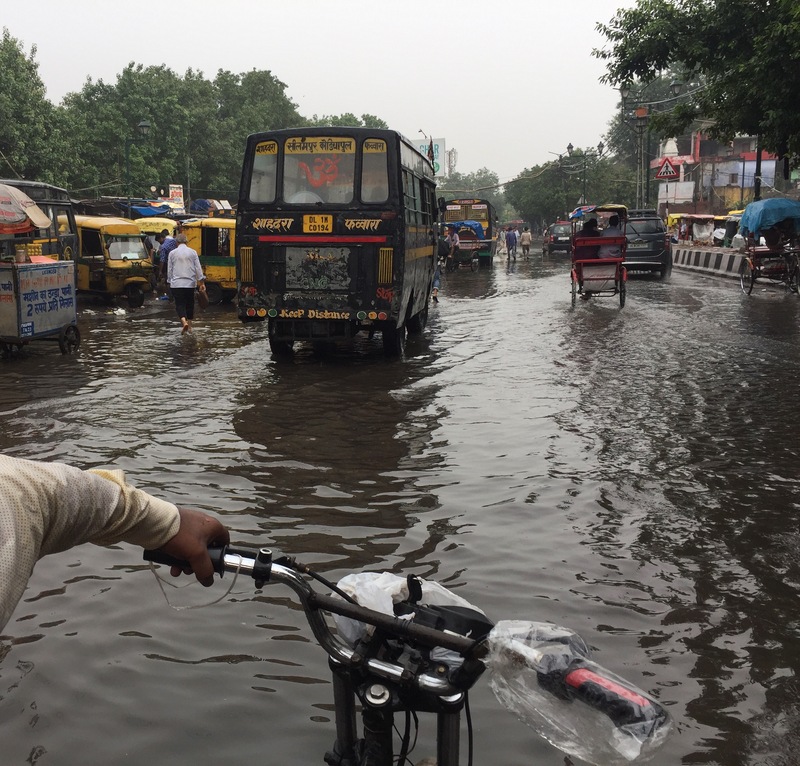 The rains whilst giving much-needed relief from the heat brought the city to its knees. The traffic was gridlocked and the streets flood within minutes. What I didn’t see was tempers overheating ( apart from the obligatory horns that form part of the daily noise in Delhi) or people getting aggressive, but rather, in general accepting and enjoying the rain, getting on with their day and being part of the moment. 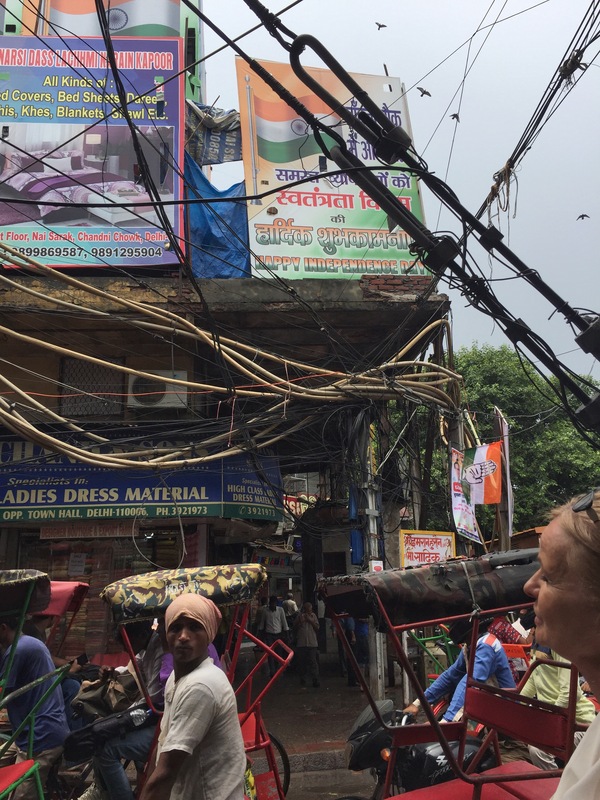 The ever precarious overhead wires! A visit to Old Delhi is a must whilst you visit here.There is almost a demarkation line between the old and the new. Specifically the spice markets of Old Delhi were the destination for today. Once in the Chandni Chowk area everything changes, cycle rickshaws and other auto rickshaws that are only specific to this part of the city ( not allowed into the other areas) abound. This meant getting to know the prices again. Our first trip seemed very cheap at 20 rupee, the driver assuring us his umbrella ( cover on cycle) would keep us dry… after about 50 meters we were soaked so opted to stand in the shelter of a Shiva Temple to wait out the downpour… which only got worse and flooded our comparatively dry spot. Everyone was quiet and happy for the rain but being eager torsits we decided to brave it. The result was not good and the driver announced the price was actually $20 USD whaaaat? Sure it’s fine to up the price for tourists and haggling over small price hikes for people who earn so little is unfair in my opinion. However this was not on… so beware of this- the US dollar trick was one I hadn’t seen before. After negoation out of this one we finally found the famed spice markets. 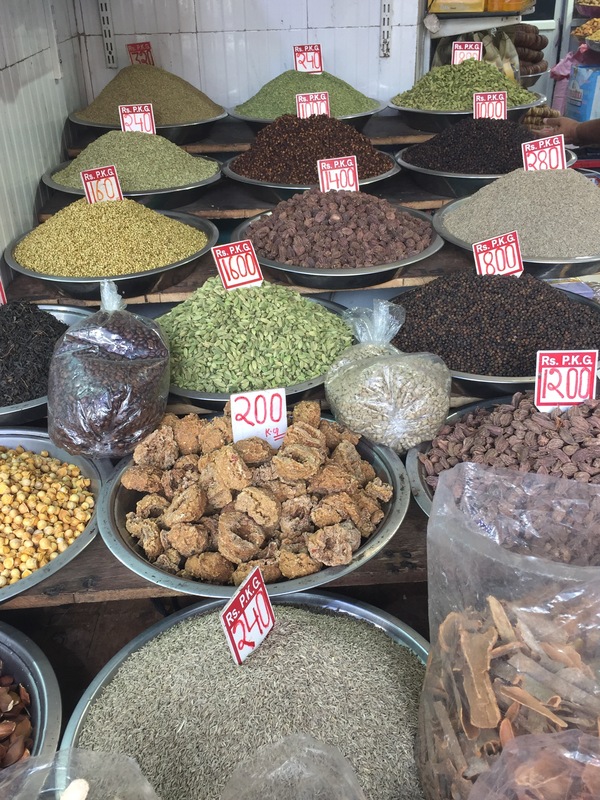 A network of streets with all sorts of colourful samples of spices and legumes varying in quality and size. Obviously there is much more going on behind the scenes as men with loads of books and dockets were intensely busy! Not being one for organized tours this may have been an instance where we would have learnt and understood a lot more had we done this. The streets are chaotic, dirty and probably a place not for the faint hearted. If you are going to pick a walking tour make sure it is one with only a few people as trying to stick with a group honestly would be akin to herding cats! 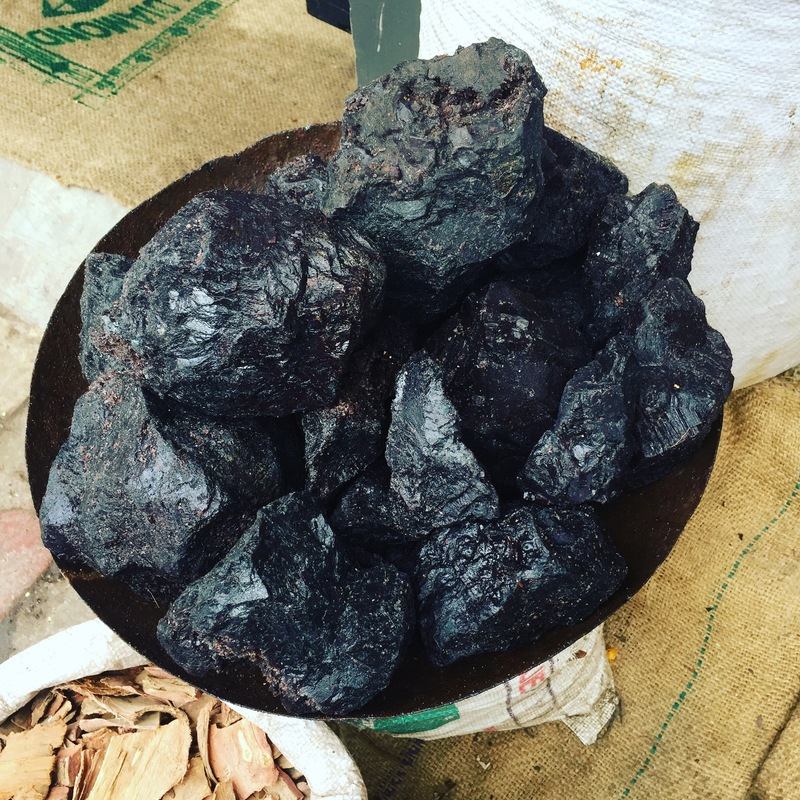 Spices are a sensory pleasure so spotting a vessel full of something resembling coal was instantly interesting to me . It was indeed Indian black salt, an ingredient I have used but was not aware of its raw form. Also known as kala namak or sanchal. It has a particularly sulphuric smell that is so good in vegan cooking as it makes stuff smell and taste like egg! Its health benefits are numerous according to ayurvedic medicine. Of course this had to be a take home souvenir. Why why why did I decide two kilos of salt was a good idea to haul around in my bag all day. Because it’s what I do, travel and cook….sore shoulders are a small price to pay. Check out the blogs by Food Tour In Delhi and read some to the great reviews they have… I think well worth it! ← India Delhi #1 Friendship day, Lord Krishna.